Contrary to popular belief, not all millennials are waiting to buy a home. I am one of the youngest employees at VHDA, born in 1990. My decision to purchase was due to the cost of renting vs. purchasing. After realizing my off-campus college apartment for two years cost over $15,000, it made sense to me financially. I had the unique advantage of working part-time for a Realtor while in college. The knowledge I gained from that experience is what gave us the courage to purchase. Here are the four factors considered when we purchased our home last year. Room to Grow: The process of purchasing a home was the most stressful time of my life: the credit checks, account monitoring, Realtor negotiations, etc. I do not want to go through this process again anytime soon. I chose a home that would allow me to begin a family. 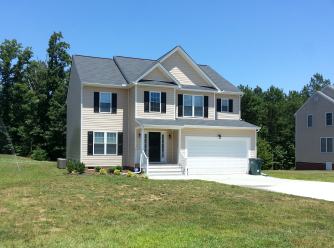 More Bang for my Buck: I chose to move to the east end of Henrico County. A two-bedroom apartment in the West End of Henrico was more than my mortgage for a four-bedroom home. Neighborhood Amenities: We have a relatively small homeowners’ association fee that provides pool access and security patrols throughout the day and overnight. Although I didn’t want to live in the city, I love that I am only a 10-minute drive to downtown Richmond. Sound Investment: Home values in the Short Pump area of Henrico County doubled with the addition of the Short Pump Town Center, a large shopping and entertainment area. There is a proposal for a “Short Pump-like” shopping facility in Varina, very close to where I live. My hope is if I decide to trade up to a new home, I will be able to sell my home for a profit.